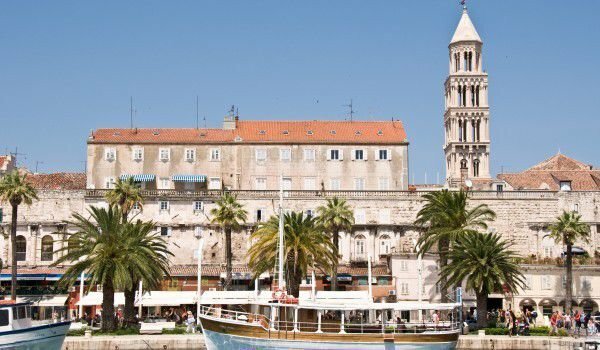 Split is one of the fundamental historic Croatian cities. It is located in the Adriatic Peninsula, located in the central part of the Dalmatian coast (Central Dalmatia). Split is the most important location along the coast and the country's second largest city on it. Today, Split is the administrative center of Split-Dalmatia, but since the past is linked to a dramatic and intriguing history. Back in 295, it emerged as a major center of the Roman Empire after the Emperor Diocletian raised here an enormous and impressive palace that occupies an area of 18, 000 square meters the fortress became the heart of the city, and in subsequent centuries growing it like wildfire. During the medieval times, the fortress town beyond the fortified walls of Roman architecture is partly changed, but in contrast, quite impressive Renaissance buildings are built. From 1420 as part of the Venetian Empire Split undergoes unprecedented prosperity, mainly because of its commercial port. To the existing Roman and Renaissance buildings in the next 400 years are added sumptuous Gothic palaces and temples. Four city gates are in the old town of Split. Inside are more than a few historical monuments. Besides the ruins of the palace of Diocletian, here you can see two interesting museums. In the 15th century there was built a palace of the papal family, which has now become a city museum. With its impressive Venetian Gothic architecture, it is a favorite place for pictures of most tourists in Split. Besides it, in the western part of the ancient town is situated the so-called left or National Parliament Square, where the building of the old Gothic building houses the Ethnographic Museum. An old Egyptian sphinx faces the Imperial Mausoleum. It is housed in one of the oldest cathedrals in the world. The front has unique wooden gates, dating from the 12th century and which have scenes from the life of Christ carved. The best time to visit Split, is in the summer months between May and October. During this season, in Split is held the summer festival, which has a lot of positive emotions.